Miniature Jaw Couplings. Join misaligned or different diameter shafts. "A" 3mm 4mm 5mm 6mm 8mm 1/4"
Miniature Coupling. Bore Sizes: Bore 1 = 3mm, Bore 2 = 3mm. ..
Miniature Coupling. Bore Sizes: Bore 1 = 3mm, Bore 2 = 4mm. ..
Miniature Coupling. Bore Sizes: Bore 1 = 3mm, Bore 2 = 5mm. ..
Miniature Coupling. Bore Sizes: Bore 1 = 3mm, Bore 2 = 6mm. ..
Miniature Coupling. Bore Sizes: Bore 1 = 3mm, Bore 2 = 8mm. ..
Miniature Coupling. Bore Sizes: Bore 1 = 3mm, Bore 2 = 0.25". ..
Miniature Coupling. Bore Sizes: Bore 1 = 4mm, Bore 2 = 4mm. ..
Miniature Coupling. Bore Sizes: Bore 1 = 4mm, Bore 2 = 5mm. ..
Miniature Coupling. Bore Sizes: Bore 1 = 4mm, Bore 2 = 6mm. ..
Miniature Coupling. Bore Sizes: Bore 1 = 4mm, Bore 2 = 8mm. ..
Miniature Coupling. Bore Sizes: Bore 1 = 4mm, Bore 2 = 1/4". ..
Miniature Coupling. Bore Sizes: Bore 1 = 5mm, Bore 2 = 5mm. ..
Miniature Coupling. Bore Sizes: Bore 1 = 5mm, Bore 2 = 6mm. ..
Miniature Coupling. Bore Sizes: Bore 1 = 5mm, Bore 2 = 8mm. ..
Miniature Coupling. Bore Sizes: Bore 1 = 5mm, Bore 2 = 1/4". ..
Miniature Coupling. Bore Sizes: Bore 1 = 6mm, Bore 2 = 6mm. ..
Miniature Coupling. Bore Sizes: Bore 1 = 6mm, Bore 2 = 8mm. ..
Miniature Coupling. 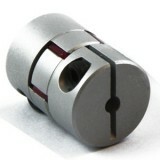 Bore Sizes: Bore 1 = 6mm, Bore 2 = 1/4". ..
Miniature Coupling. Bore Sizes: Bore 1 = 8mm, Bore 2 = 8mm. ..
Miniature Coupling. Bore Sizes: Bore 1 = 8mm, Bore 2 = 1/4". ..
Miniature Coupling. Bore Sizes: Bore 1 = 1/4", Bore 2 = 1/4". ..